Category: It’s Good to be King! The Austro-Hungarian Empire gave the world so much to enjoy: music, literature, food, Lippizaner Stallions, Sigmund Freud and the Von Trapp Family. But who would have thought that other major contribution would have been those beautiful, over the top costumes of the royal court? Of course, I had always been vaguely familiar with that genre, in particular having caught a glimpse of the late ‘Heini’ Von Thyssen traipsing about in full Austro-Hungarian drag at some sort of cultural event or other in Madrid back in the 90’s. Heini’s ensemble echoes the splendor of an era lost in time. Like the Hapsburgs, Heini was a voracious art collector and his extensive compilation is on view at the museum which bears his name: Museo Thyssen-Bornemisza in Madrid. 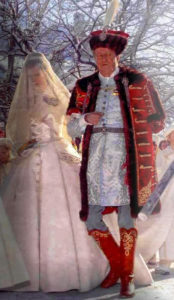 In an ironic twist of fate, his eldest daughter Francesca, wound up marrying a Hapsburg. 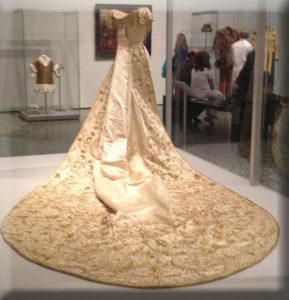 My costume designs for a recent production of ‘The Sound of Music’ notwithstanding, it wasn’t until I saw the ‘Hapsburg Splendor’ exhibit at the MFAH that I was able to really appreciate the richness and luxuriousness of their court costumes. Now, I know that some of you cynics about there are saying: That exhibit happened two years ago. Why are you blogging about it now? Well, why not. 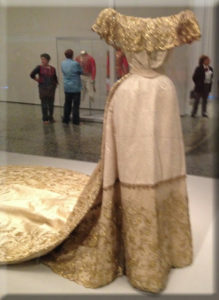 It was a great exhibit that not only featured some beautiful costumes but a lot of important art as well. 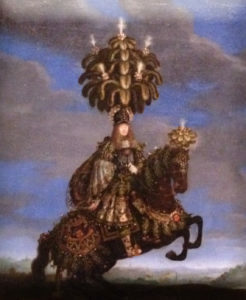 As mentioned earlier, the Hapsburgs, like my buddy Heini, were prolific art collectors and this exhibit, in particular the costumes merit a belated blog. Besides, now I can finally delete the exhibit pictures from my iPhone! The exhibit begins with an overall view of the Hapsburg Dynasties then segues into their very extensive art collection with examples from Caravaggio, Velásquez, Holbein and on and on. 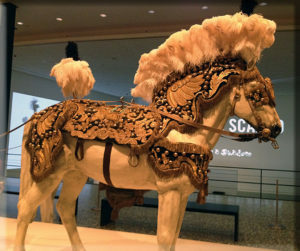 Finally the last hall is the one that features the costumes and it showcases examples of court dress, couture, military uniforms, heck, even the horses got into the act! I will cover the fine art towards the end of the post, but being that this IS a costume blog after all, we will begin there. 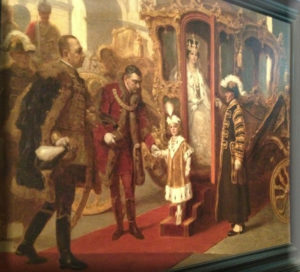 Let’s begin with this painting depicting a young prince alighting from his carriage because it serves as a good reference point for the costumes featured throughout the exhibit; Study the painting closely and you will see each one of those costumes was represented in the exhibit. It’s interesting to see how the Empire, being a mix of different cultures and ethnicities, also displayed this diversity in the clothing. As you view the details of their attire, one can also see elements of the various kingdoms which comprised this multi-cultural nation. 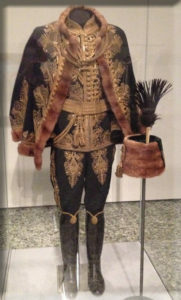 A ceremonial velvet tunic trimmed in ermine with the matching hat and shoes. Up until the early 20th Century most children of a certain socio-economic class were dressed as ‘little adults’. It’s interesting to see the shift begin towards more ‘child appropriate’ attire. This precious costume was worthy of a little prince! Sadly, little Otto was never to inherit the title of Emperor due to the dissolution of the Austro-Hungarian Empire after WW1. But like most of his namesakes he had the talent for making lemonade out lemons and went on reinvent himself in other ways. Otto actually worked for a living as a businessman and writer. He even dabbled in politics by being an early supporter of the EU and served in the European Parliament. Bonus trivia: It was Otto’s son, Karl, who married Heini’s daughter Francesca. Keeping the ‘light’ in Light Calvary. The amount of gold in the bullion stitch embroidery would probably break a horse’s back. But I am assuming this is more of a ceremonial garment than an actual military uniform. 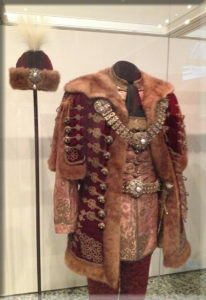 Still, the detail and workmanship is lovely and I am sure that the wearer would have looked dashing on his horse. The pelisse over coat is usually worn over the left shoulder and it served to prevent swords cuts during battle. 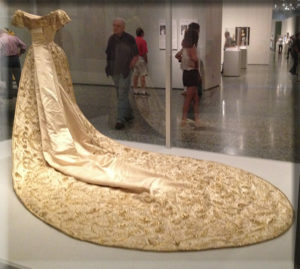 I’m curious as to why the curators of this exhibit chose to not show it worn in this fashion. Perhaps an oversight? Looking at the hardware on this get-up, I can totally see this serving as an influence for a cosplay step punk costume. Couldn’t you? ‘A League of Extraordinary Austro-Hungarian Gentlemen’ perhaps? Unfortunately, time has faded the color of the brocaded inner tunic. 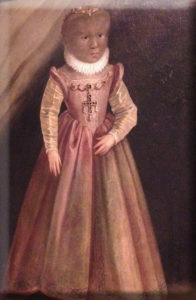 But I would imaging it would have been a rich burgundy red just like the one shown in the painting. This footman’s liveried uniform is in excellent condition and is exactly as represented in the painting. You can see him holding the door open as our little prince alights from the carriage.There was no description of the fabric but I am assuming that it is some type of wool melton and I am more than willing to assume that underneath the fancy braided livery embellishment is there is a dolman sleeve. I say this because the majority of the men’s costume feature a dolman sleeve as opposed to a traditional set in sleeve that was seen in other European court costumes. 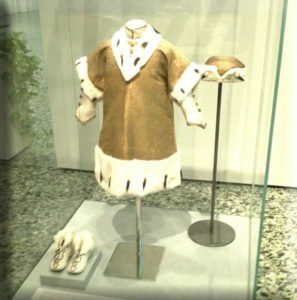 A dolman sleeve is actually of Turkish origin, and being that Austria-Hungary and the Ottoman Turks had a long history together (not always nice), it serves to prove how their clothing reflected the many cultures under their rule. 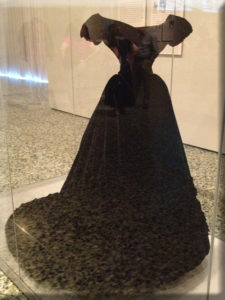 Seeing this elegant ball gown brought many bittersweet emotions because of the tragic legacy of its wearer. Empress Elisabeth of Austria also known as ‘Sissi’ can only be described as the 19th centuries answer to Princess Diana. Sissi was a free spirited and progressive thinker who wrote poetry and believed in the benefits of diet and exercise. 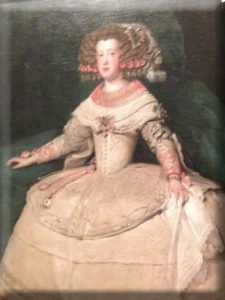 At a time when women were constricted by their corsets, Sissi believed that one maintained their figure through proper diet and calisthenics. So much so that she had a special gymnasium built at the Hofburg palace where she would work out daily. And one can appreciate the results of these work outs from the tiny waistline of this design by Charles Frederick Worth. Like Diana, she chafed under the stifling formality of the Austro-Hungarian court which caused her to suffer from bouts of depression and bulimia. Like Diana she was interested in couture like those of the aforementioned designer. And like Diana, she died a tragic and unnecessary death, having been assassinated during a visit to Switzerland by an anarchist who confused her for someone else! 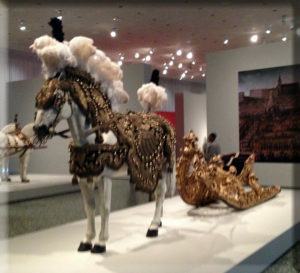 The Hapsburgs were prolific art collectors and the exhibit did not disappoint. 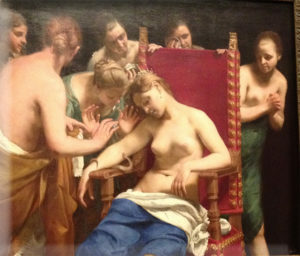 The works ranged from Roman antiquities to renaissance and baroque masters. 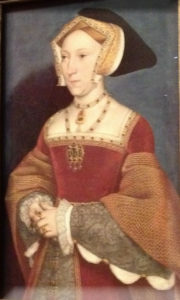 Here is a sampling of the artworks beginning with the portrait above of Jane Seymour by Holbein. You might ask how a painting that was commissioned by Henry VIII of England wound up in Vienna? The answer is a long and convoluted one having to do with Master Holbein selling his works to the highest bidder. Obviously, the Hapsburgs had deeper pockets than the Tudors. 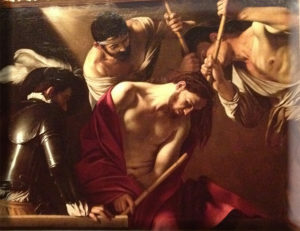 The exhibit has returned to the Kunsthistorisches Museum in Vienna. 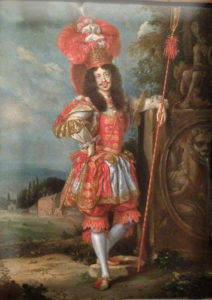 Posted on January 19, 2018 January 22, 2018 Categories It's Good to be King!Tags Austro-Hungarian Costume, bullion stitching, Caravaggio, Charles Frederick Worth, Costumes by Antonia, Custom Made Costumes Houston Texas, Dragoon costume, Empress Elisabeth of Austria, Hapsburgs, Holbein, Holy Roman Emperor, Houston Costume Design, Hussar costume, Infanta Maria Teresa, Jane Seymour, Leopold I, Otto von Hapsburg, Pelisse jacket, Princess Kinski, Rubens, Sissi, Thyssen-Bornemisza, Titian, VelazquezLeave a comment on It’s Good to be King!